The Beatles visited Bangor on 25th August 1967 to attend a conference at the Normal College, now the University's Management Centre, led by .... Beatles Radio: The Beatles, Solos, Covers, Birthdays, News The Fab 4 and More! A handwritten letter from John Lennon’s Aunt, Mimi Smith, which dates from September 1967 and refers to The Beatles visit to Bangor, is set to be auctioned next weekend. 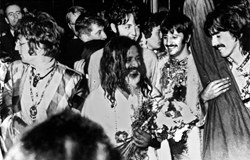 The Beatles visited Bangor on 25th August 1967 to attend a conference at the Normal College, now the University’s Management Centre, led by Maharishi Yogi, a guru in Transcendental Meditation. The visit to Bangor however was tragically cut short, after the group heard the news on Sunday 27th August, that their manager Brian Epstein had died age 32, following an overdose of sleeping pills.